Natural language processing for advanced text analysis. 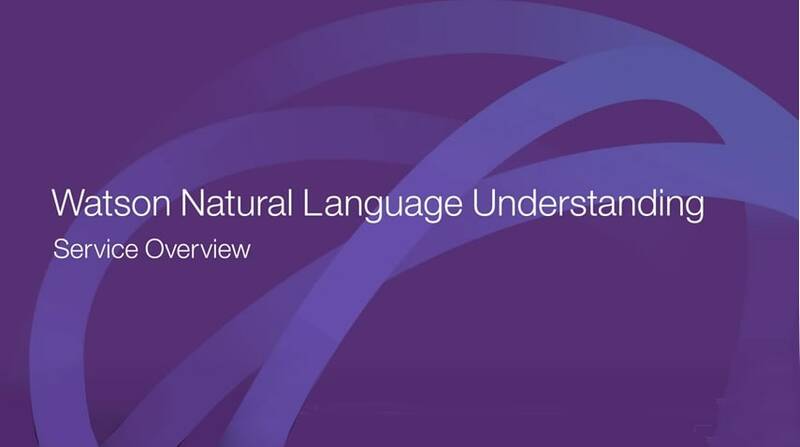 What is Watson Natural Language Understanding? Analyze text to extract metadata from content such as concepts, entities, keywords, categories, sentiment, emotion, relations, and semantic roles using natural language understanding. Engage with a full suite of advanced text analytics features to extract entities, relationships, keywords, semantic roles and more. Interpret text in thirteen different languages, with more on its way. Apply the knowledge of unique entities and relations in your industry or organization to your data. Watson is probably about 80 percent of what we do right now. We are totally wedded to Watson. — Chris Sykes, Chief Executive Officer, Volume Ltd.
IBM Watson gives us natural language understanding that moves conversations from casual enquiry towards purchase. Watson is a powerhouse when it comes to natural language processing. Categorize your content using a five-level classification hierarchy. Identify high-level concepts that aren't necessarily directly referenced in the text. Analyze emotion conveyed by specific target phrases or by the document as a whole. Find people, places, events, and other types of entities mentioned in your content. Search your content for relevant keywords. Analyze the sentiment toward specific target phrases and the sentiment of the document as a whole. Teach Watson the language of your domain by creating and training custom machine learning models. Unlock hidden value in data to find answers, monitor trends, and surface patterns with the world’s most advanced cloud-native insight engine. Quickly build and deploy virtual assistants across a variety of channels.